"Until one has truly loved an animal, part of their Soul remains unawakened!" If you are considering purchasing one of our pups, young adults or dogs. Please understand that we are very discriminating when it comes to where we place our Beloved Dogs. It is equally as important for Us to find the Proper Home for our dogs as it is for You to find the right dog. We are not like 90% of the other breeders around the USA. We actually DO CARE about where our pups go! We don't care where you Live. We don't care how large your home or yard is. We don't care how much money you earn. We DO CARE about how big your Heart is! We DO CARE about how our pups & dogs will be treated! We DO CARE about where our pups will be sleeping, and where they will be during the day while you are at work. We will ask you some questions, just as you will be asking us questions about the dog. and you plan on doing that with the new dog, DO NOT bother contacting us. That is not the type of situation we are looking for. 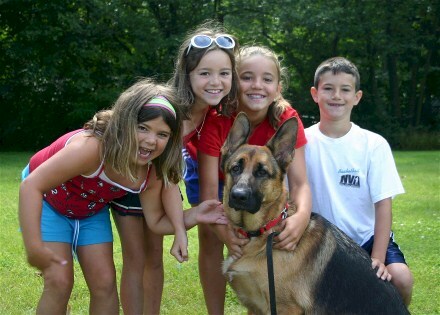 We want our dogs to be an integral part of the family. That means that our dogs LIVE INSIDE! THEY SLEEP INSIDE! They go outside to potty, play, accompany you with yard work, etc. Giving one of our dogs a Home means welcoming them into your lives and your house. We are Not Looking for a Yard for our dogs to live in. That is Not a Home, That's a Yard! If this is a problem for you, no problem, seek your new GSD somewhere else. Most breeders won't even ask you. But that's not us. Here's 15 reasons why GSD's, etc shouldn't live outside in Texas.. 1.) They are not native to Texas weather. They were not bred to withstand extreme heat and the intense sun. No dogs were. Heat Stroke can cause death. Incredible amounts of dogs die each summer from this here in Texas. 2.) ﻿The Chagas Beetle﻿. Native of South America these bugs are known as "The Kissing Beetle." They are the Kiss Of Death! They are all over Texas and Oklahoma. Over 400 Dogs have died from them in Texas. They are nocturnal and live in trees. 5.) Rabies from bats, etc. 6.) Attacks from Poisonous snakes such as Rattlesnakes & Copperheads. 7.) Fire ants and wasps, bees, spiders, etc. 8.) Coyotes can and will surround and attack your dog. According to the AKC inspector of Texas it would take several dogs the size of Great Pyrenese to defend themselves against a pack of coyotes. They will kill and then eat your dog! Not cool! 9.) Theft of your dog for resale to dog fighting groups, labratories, etc. 10.) Poisoning by an annoyed neighbor, or other evil person. 11.) Shot to death by an annoyed neighbor, etc. 12.) Escape from the yard and you may never find your dog again. It could also get hit by a car. 13.) German Shepherds were bred to stay at the side of the Shepherd (the Master). They are the Guardian of the Shepherd (the Master), not the sheep. Yes, they would herd the sheep with the Shepherd. But they accompanied the Shepherd (Master) home, keeping him safe along with his family. 14.) Because you don't keep your gun outside in the yard for protection, so why would you keep your German Shepherd outside. They can hear through your walls if someone is approaching your home. 15.) Because that's not how you Treat Your BEST Friend! 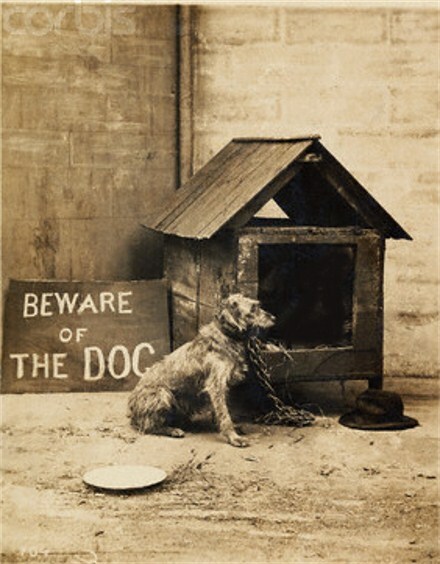 This 1907 photo shows how some dogs were kept back then. 107 Years later, some people still think this is fine for a dog.